Growing up with an Italian grandmother, desserts usually meant full-bodied, booze-spiked, often savory treats including tiramisu, Italian pizzelle cookies, pignoli cookies, and pepper biscuits. The only thing I knew about Scandinavian desserts was, well, nothing. Thumbprint cookies didn't count since I thought Mrs. Claus invented them. Not anymore. Thanks to Pat Sinclair's lovely new cookbook Scandinavian Classic Baking, I now know how to make Swedish Pepparkakor (spicy gingerbread cookies), Sandbakkels (miniature butter cookies shaped into a cup and filled with jam or cream), and Spritz (classic Swedish butter cookies made with a cookie press). Sinclair organizes her 42 recipes into five chapters: Coffee Breads, Cakes, Cookies, Tarts, Fruit Desserts & Pastries, and Traditional Favorites. Recipes are highly detailed, so even a novice baker can feel confident attempting a new recipe. You'll find sublimely simple recipes such as orange bundt cake next to more sophisticated ones such as Scandinavian apricot almond bars. Each recipe is accompanied by engaging historical facts and a beautiful, full-colored photo from Joel Butkowski. Did you know, for example, that Scandinavia is called the "Land of the Midnight Sun" during the summer since the sun never sets at higher altitudes? How about that on Shrove Tuesday (the day before Ash Wednesday) it's tradition to eat rich, buttery "Shrove Tuesday Buns" as an indulgence before the coming lean days of Lent? Sinclair also sprinkles useful tips and advice throughout the book such as how to properly beat egg whites and how to grind cardamom seeds in a mortar and pestle. Whether you're an accomplished baker or baking newbie, you'll find many sweet spots in Pat Sinclair's Scandinavian Classic Baking. One lucky Food Blogga reader will receive a copy of Scandinavian Classic Baking. To enter, simply tell me why you'd like to win the book. The winner will be announced on Monday, October 17, 2011. If you tweet about it and mention @foodblogga, I'll count that as another entry! Warm-hearted thanks to Janet Russo, my mom, for baking this Swedish Kringle with such love. 1. Heat the oven to 350 degrees F. Make the crust. Place the flour and butter in the bowl of a food processor. Pulse until mixture resembles coarse crumbs with some pea-sized pieces. With the machine running, add water and process until the dough is formed. Put dough on a lightly floured surface and shape into a ball. Divide the dough in half. Press each half into a strip about 3 inches wide and 10 inches long on a ungreased baking sheet. 2. Make the topping. Heat the water and butter in a medium sauce pan over medium-high heat until the butter is melted and the liquid is boiling. Add the flour all at once and whisk until a thick paste forms and leaves the sides of the pan. Cook about 1 minute longer, stirring constantly to evaporate excess moisture. Remove from the heat and cool at least 5 minutes to prevent the eggs from cooking when you add them. 3. Using a hand mixer or whisk, beat in the eggs, one at a time, beating well after each egg. Each egg should be completely mixed in before the next egg is added. Stir in almond extract. 4. Spread over the pastry strips, spreading almost to the edges. Bake 50 to 60 minutes or until puffed and golden brown. Cool on wire cooling rack. As the pastry cools, it will collapse. Cool completely. 5. Make the frosting. Mix the confectioners' sugar, butter, almond extract, and 2 tablespoons whipping cream or milk until smooth. Add more whipping cream or milk if needed for spreading consistency. Spread over pastry. Cut into slices before serving. UPDATE: The winner was announced in the comments section, but I'm adding it here for those of you who didn't see it. Congratulations to Nicole Antoinette! You're the winner! That treats looks amazing! As I'm a big fan of baking and of Scandinavia, I would be so happy to win this book. I'd love to win a copy of Scandinavian Classic Baking! I am planning a Smörgåsbord and Julbord for Christmas this year, and the book would help a lot with recipe planning! To counterbalance all those salads I eat and all that jogging I do! This cookbook looks like it's filled with lots and lots of yummy treats that make all that other 'watching what I eat' worth it. I grew up on my grandmother's thumbprint cookies and Spritz. MAN, I miss those cookies! Who wouldn't want to win this book?! I love baking in my own kitchen and certainly wouldn't object to the idea of adding another cookbook to my collection! The theme of pastries and cakes sounds delicious! After reading this post/recipe, I feel like I absolutely need this cookbook! It sounds fantastic. I love baking, and am constantly looking for new and interesting treats to make. I am excited to fight for this book which would make an excellent christmas gift for my Scandinavian friend...after I take it for a test ride, of course. Those butter cookies sound perfect to help use up my many jars of homemade jams! I am Scandinavian, and I would love this cookbook! I have seen commercially made kringle, but never tried it. I would love to try this recipe, and many of the others, for the holidays. I've dabbled and eensy weensy bit in Scandinavian cooking and everything I've made - I loved! I think it's about time I checked out that book! i'd like to win the book because i'm addicted to baking and would love to try my hand at some scandinavian baked goods! I would like to win it as I want to see other recipes besides the Kringle that you posted here. Oh these photographs are just so delicious-looking! 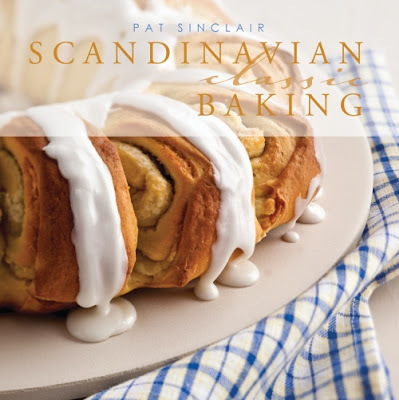 I would love to WIN this cookbook...would love to learn all about Scandinavian Baking. I don't think I've had the pleasure of baking anything like this before. It would open up another fabulous food phase for me. Thanks for featuring it, Susan! I'd love to win a copy, since I'm an avid baker and have a bit of a fascination with Scandinavia, but haven't really found a good cookbookso far. I love cookbooks and this one looks absolutely amazing. I'm sure I will enjoy it. Because I'm Scandinavian!! My mom makes Spritz (we call them almond cookies) and I've made the Kringle working for a great caterer. I'd love to check out all of Ms. Sinclair's recipes & Joel's pix. Yum! Thanks! Yum! I'm all over this recipe!!! I am a long time baker and mother to four boys who would be very receptive to more recipes like this one. I'd love to win because I'm always looking for new yummy recipes. The one you posted looks amazing! Oh this looks so yummy! With recipes like this one who wouldn't want a copy of this book :-) Thanks! 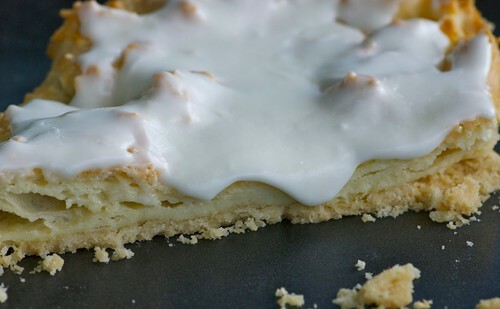 I have a recipe similar to this kringle that has been a family favorite for years. I would LOVE to try more Scandinavian treats!!! I would love to win this because I love Scandinavia particularly Sweden. I love their culture, including their food. Scandinavia has some of the best pastries in the world! I would love to win this cookbook! My husband is of Swedish descent and he does not know any delicious authentic recipes! 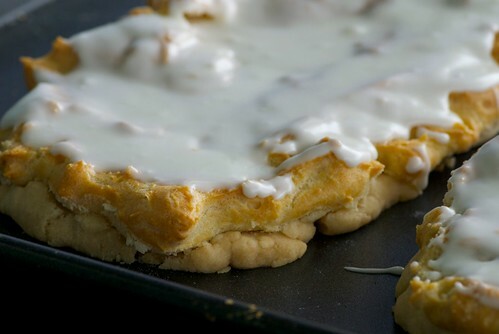 I was fortunate enough to try the Swedish Kringle and I would really love to try the others and finally have some great recipes to add to our growing recipe collection. Oooh! Scandinavian sweets, and the cuisine in general, were relatively unknown to me...until I stayed in Finland for a while a totally loved it! I am sure this is a fantastic book! I love baking, and have a couple of Beatrice Ojakangas' books. Love Scandinavian bakes. Because I took 2 years of Swedish is college in honor of my great grandparents! And, although I will never understand the Scandinavian fascination with lutefisk, I do love kringle and lefse! I want to win this cookbook so I can make that delicious looking treat on the cover, Yum! Glad you like the book Susan. Lots of treats for the Holidays in there, too. I've been looking for an authentic Scandinavian shortbread cookie recipe for a long time! Hopefully this will have the ultimate! to try a new genre! This kringle looks absolutely gorgeous also, just my cuppa tea! I love baking but I've never explored Scandinavian baked goods. Would love to try since my hubby is half Swedish! That kringle looks amazing! I'd love to make that and other treats from this book. I'd also like to learn more about Scandinavian baking. Sorry for the delay in announcing the winner. The winner of the cookbook is Nicole Antoinette! Thank you to all of you who left comments and tweeted about the give-away. There will be many more give-aways to come, so good luck next time! It's you, Nicole! Please send me your name and mailing address. Ohhh yayyyy!!!! I'm so excited that I won! I happened to stumble over this post and while this might not be the best place for it, I just wanted to add a small tip to anyone interested in Swedish baking (seeing how I am Swedish and love baking). There's a classic book in Sweden called Sju sorters kakor. (Traditionally, you should serve seven different kinds of cookies, including one kind of cake slices and one kind of vetebröd, e.g. cinnamon buns, to the coffe when having guests. Hence the name). It is available in English under the name Swedish Cakes and Cookies. Easily recognized by the red and white checkered cover.